While I've blogged since 2001, I resisted social networking tools for a long time, probably the result of seeing my students use MySpace. To me it looked like Geocities, only more judgmental and vain. I finally joined Twitter in the fall of 2008, Facebook in spring of 2009, and last fall I took steps to separate personal and professional networks. Now I use all kinds of social services, and often find myself thinking more about how to use them than actually using them. Hopefully in this blog post all that thinking will pay off. Like I said, those are my primary tools. There are many more out there, and new ones show up all the time. As we add these new tools to our toolboxes we gain powerful new ways of connecting with our peers. Unfortunately, that power is diluted when the interaction between tools gets complex, as it has with Google Buzz. A number people in my PLN have tried to integrate Buzz into their PLN with mixed success. Buzz has too much promise to ignore, so let's learn from our experience and think about how we're using Buzz. People will remember the privacy mistakes Google made when they launched Buzz, but I think they made another mistake that has gone unnoticed: instead of importing tweets into Buzz, Buzz should be using Twitter to notify people of new buzzes! Buzz is bigger and more capable than Twitter, and I think importing tweets will prove to be a backwards flow of information. If your blog had the option to import each of your tweets as a new blog post, would you do it? Of course not. You wouldn't use Diigo to bookmark your tweets to share them, either. Twitter asks you, "What's happening?" and while we've used it to do much more, tweets aren't proving to be at all useful in Buzz. We've all used Twitter to notify our PLN about our new blog posts; let's use Twitter the same way to alert our PLN about a new buzz. The model is far from perfect, for sure. You can save and share in both Diigo and Google Reader, but the services are different enough that I use each independently for each interesting site I want to share. (Thus the reason for the dotted line.) The "Share to Reader" bookmarklet gets pages into Buzz, and I would personally be happy if Google bought Diigo and really worked to nicely integrate its capabilities into Buzz and Reader. Also, Google really should integrate blog post comments in Buzz to Blogger, and vice versa. We really need a unified commenting system in a lot of places, but there's no excuse for Google to not have this figured out for their own services. 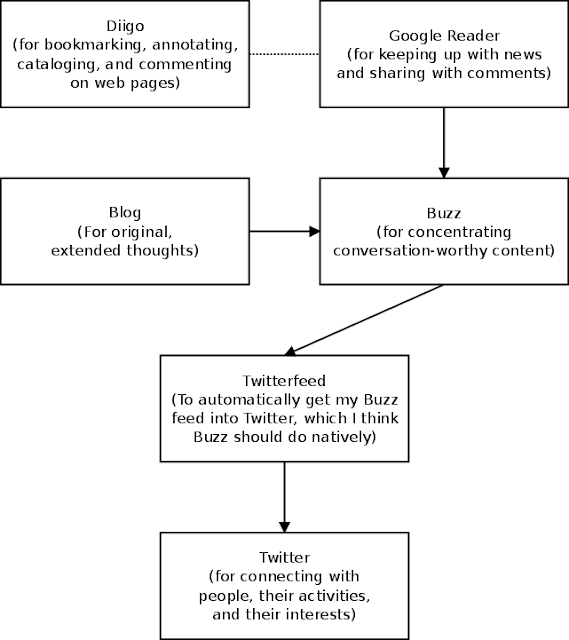 Lastly, Twitterfeed shouldn't be necessary, as I think Buzz should have the option to post to Twitter.